Tears welled up at the gratitude I feel in knowing this family, who is one of the truest examples of a beautiful family of God that you would ever have a chance to meet. For her to even take the time out to text me shows just how extremely kind and selfless this family is. I was completely at a loss for words. The work I do is only a reflection of what is already there. In every family I photograph (and especially in theirs)…I see beauty, I see truth, I see love. All that already exists, but it’s just my job to capture it in time. I still remember that day last year of the shoot, it was a bit of a windy and blustery day but Gene and the whole gang pushed through with smiles on their faces. The joy and warmth this family has and the LOVE they have for each other is authentic and true, and it was a revelry to witness. It was undoubtedly evident that Gene loved his wife, children and grandchildren with all that he had, and they loved him back just as deeply. This “job” of mine has always been a mission and a calling first and with every new family I encounter I pray for the grace to do the best job I can to remind them of that Love in photographs. Thank you Gene and the whole Connolly family for allowing me to be a part of their lives and showing us all what real love is. I will always cherish that gift with all my heart more than you will ever know. After this and also having my own grandma pass away earlier this year, I’ve been affirmed more than ever as to how important photographs with grandparents are. 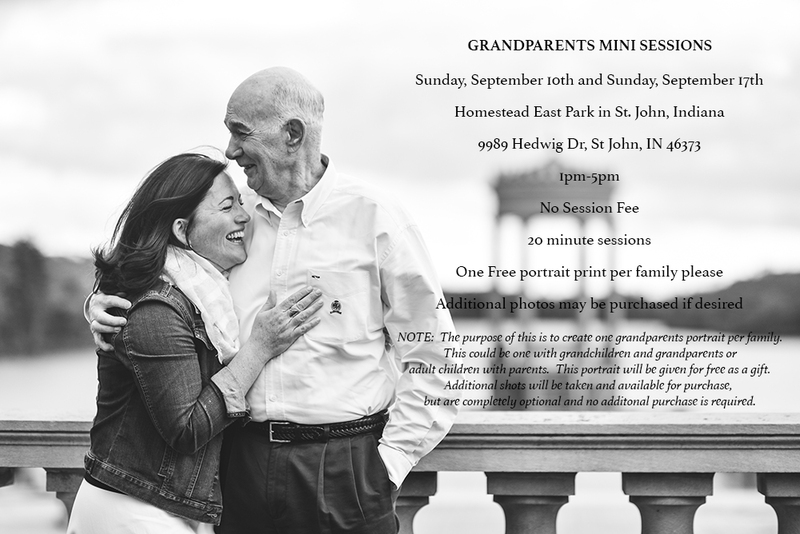 As timely as Grandparents day is this month, I’ve decided to do two very special Grandparents portrait session days in the month of September (Tentatively September 10th and 17th) in St. John, Indiana. The purpose is to create one special portrait with grandparents for each family to have. So I will be giving away one free portrait print to as many families as possible. No session fee because I believe in it that much. I’ll only limit it to as many as I can handle in one day but other than that I hope to give this to as many desiring families as possible. If you have parents or grandparents you’d like to receive a free portrait from just comment here on this post, email me or sign up at this link: https://app.acuityscheduling.com/schedule.php?owner=14232251&notembedded=1.